I started this year off putting jokes into the kids lunch boxes. They have gone over so well with M and M (especially the knock knock jokes), I decided to round up some extra special jokes for the month of October. Any guesses what the theme is? You got it. 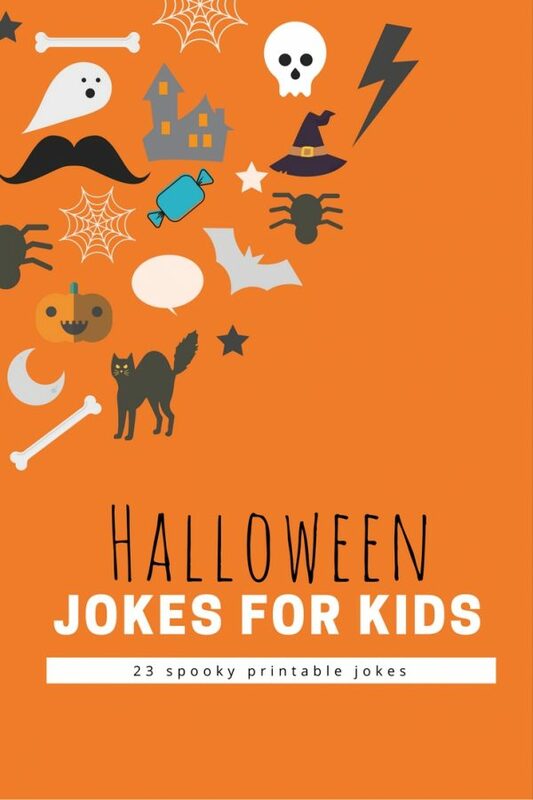 Halloween jokes for kids. Fun right? M and M love Halloween. What’s not to love? Scary storytelling, spooky pretend play and of course all the candy! I just know these jokes are going to be a huge hit. There are 23 jokes. I counted and that is the number of school days in October. You can write them on a napkin or use the printable Halloween Jokes for Kids. I think I’ll do a mix of both this month. Having the printable ready will make it easier for those days I’m rushed. Update: I’ve heard from a few joke lovers that these work great for handing out along with a piece of candy to the trick or treaters. Click here to print these jokes. What does a ghost do to stay safe in a car? — He puts on his sheet belt. Why did the witches cancel their baseball game? — They couldn’t find their bats. What do monsters turn on in the summer time? — The scare conditioner. Why is it safe to tell a mummy your secret? — It’ll keep it under wraps. Why was the jack-o-lantern afraid to cross the road? — It had no guts. What is a scarecrows favorite fruit? — STRAW-berries. What is the best way to speak to a monster? — From a long distance away! Where do baby ghosts go during the day? — Day-scare centers. What do birds say on Halloween? — Twick o Tweet. What is the most important subject a witch learns in school? — Spelling. What kind of roads do ghosts haunt? — Dead ends. Why didn’t the skeleton go to the ball? — Because he had no BODY to go with. What do witches put on their hair? Scare spray. Why don’t ghosts like rain? — It dampens their spirits. What did the scarecrow say to the kid dressed up as corn? — That costume is a-MAZE-ing. What candy do you eat on the playground? — Recess pieces. Why do witches wear name tags? — So they will know which witch is which. Why didn’t the scarecrow eat dinner? — He was already stuffed. What kind of monster loves to disco? — The boogieman. Why do people like vampires so much? — Because they are FANGtastic. What does a cool witch ride instead of a motorcycle? — A Brrrrrr – oomstick. How do you make a skeleton laugh? — Tickle its funny bone. If you loved these Halloween jokes make sure to check out the Fall Jokes or Christmas Jokes! Do know any Halloween jokes for kids? Add them in the comments. What’s a ghost’s favorite pie? Boo-berry! Why did the ghost cross the road? – To get to the other side. How do you mend a broken jack-o-lantern? What is a ghost’s favorite food? last year, I started putting jokes in my son’s lunchbox. He and his friends love it. In fact when my husband makes lunch and doesn’t include a joke, my son and his friends are disappointed. Thank you for more jokes, it does get challenging finding new ones he will get. Thank you! I printed these out to put with the treats for my son’s class. These are great! I am a reading teacher with 45 students on my caseload. I was looking for something not candy and affordable. I am going to do some kind of cute packaging and write don’t die laughing:) I love that the reading teacher gives students a treat they read!! Where do goblins get their hair done? Why did the skeleton cross the road? What do you call a bee in a graveyard? Great collection of Halloween jokes. Thanks for sharing. What’s it’s like to be kissed by a vampire? don’t cry its just a joke! All 23 Printable Halloween Jokes Sent Straight to you!